Published March 1, 2018 at 3:40 p.m. In a move that could dramatically change the ever-changing East Side, an anchor property that's been vacant almost a year on North Avenue has been bought, and plans are already in place for a major transformation. Milwaukee developer Joshua Jeffers purchased the former G-Daddy's BBC and Hotel Foster buildings at 2012-2028 E. North Ave., he confirmed to OnMilwaukee on Thursday, and intends to start redeveloping them this spring with hopes of catalyzing the much-angsted-over neighborhood. According to state and city records, the property – assessed at $1.7 million – was sold by Sasha LLC to Jeffers for $1.5 million. A year ago, the entire complex was listed at $2,299,000, which included, among its nearly 20,000 square feet of interior area, three bar/restaurant spaces and a third-floor office space. 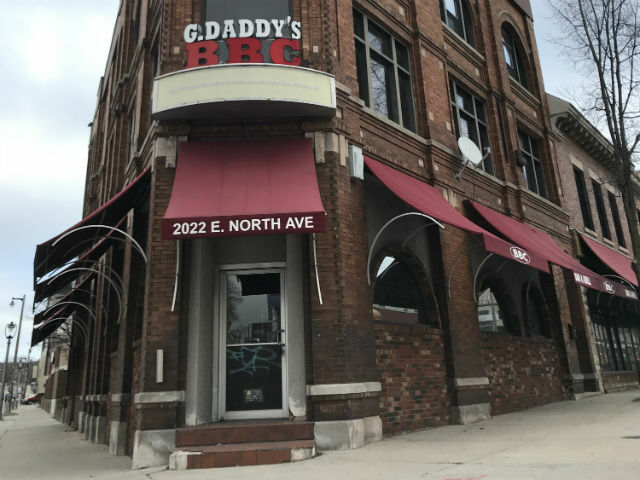 Jeffers intends to do a "top-to-bottom historic restoration" at 2022 E. North Ave., which was G-Daddy's BBC for two decades before closing last April. He says the entire building needs to be redeveloped, starting with the floor – "easier said than done" because it's uneven and about 18 inches above street grade – which will be removed and reset. Then Jeffers can move on to the part of the renovation he's particularly excited about: street-level activation. Underneath the maroon BBC awnings, he says, are old storefront windows that, before being bricked up, allowed light in to the space and interaction at the prominent street corner. Jeffers says he wants to remove the awnings and do a "facelift" on the exterior façade, restoring it to its original appearance and "opening up" the century-old Romanesque revival building, which "will really help people visualize what we're going to do with it." Inside, he says "it takes a lot of imagination to see it right now," but with the tin ceilings, cream city brick, cast-iron beams and other original features, the building has a lot of potentially beautiful aesthetics. As for future tenants, while Jeffers says that "we don't have any specific users in mind yet," the space – on the northeast corner of Farwell and North Avenues – lends itself to a bar/restaurant concept and he anticipates it will go to a "national or regional retailer." Jeffers also plans to renovate the second and third floors at 2022 E. North Ave. in hopes of turning them into a "creative office space," noting the rich wood floors, high ceilings and large windows. Much of Jeffers' real estate portfolio has involved redeveloping properties as apartments and offices. The four buildings are grouped as one tax parcel, but – except for the former Hotel Foster bar, a 2,900-square foot space he thinks will become its own bar or restaurant – they are interconnected and Jeffers believes that presents more imaginative possibilities. It was Jim Plaisted, the executive director of the Historic Third Ward Association who spent many years leading the East Side Business Improvement District, that first reached out to Jeffers a year ago about buying the properties. Jeffers, who owns a couple of Brady Street-area properties, including the one that houses The Diplomat restaurant, has experience renovating historic places, including the Mackie Building Downtown and another on 65th Street and North Avenue that he says may serve as a template for the new project. Given all the local consternation about the East Side's shifting landscape – many longtime bars have closed, while upscale residential and restaurant properties have come in – Jeffers hopes this redevelopment can be a shot in the arm for the neighborhood. "All the North Avenue corridor change has been alarming," he says. "For it to sort of fall on hard times has been disappointing for a lot of people. But everyone has been so tremendously supportive. "This is the most prominent property, the corner property, for that area and it has the potential to be transformative."